Wait until you hear this!!! I am so happy and thankful for your advice. I went to a new periodontist today for a second opinion. He said my gums were in excellent shape and keep using the hydrofloss and whatever else I am doing. In May when I visited the first periodontist he said I needed surgery. Today my gums are healthy and no surgery. I am so happy and what a savings. It would have cost be $5,000 for the surgery. I can't thank you enough for all the advice you have given me. Your book is terrific!! 'Thanks Lynn, I am delighted to hear that you found both the book and the Hydro Floss to be beneficial to you. I hope that more people can learn about the power of the Hydro Floss Oral Irrigator. Though the HydroFloss comes with 4 regular jet tips, you may want to investigate the Pocket Pal Jet Tips. Please keep in mind that the Pocket Pals or any other specialty tip are designed for use 'in addition to' rather than 'instead of' the regular Hydro Floss tips. 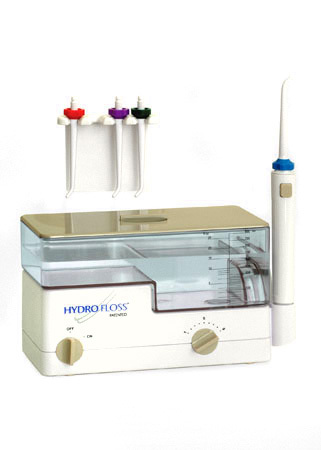 The Hydro Floss IS the premiere dental health home care instrument on the market today. The truth of the matter is that this is the center piece of my personal dental health care regiment. I am the author of the book: What You Should Know about Gum Disease. In this book, I reveal my personal struggle against gum disease and what I learned to stop it. While my personal experience seems singular, it is not. I talk to many customers about the power of the hydro floss and I am hearing similar stories to my own. Many people have said that would not want to be without their hydrofloss oral irrigator. Did you know that the Hydro Floss has been written about in the Journal of Clinical Periodontology not once, but twice! This is a prestigious peer reviewed journal of the periodontal community. In both studies it was shown that the Hydro Floss reduced the amount of plaque build up between office visits much better than other kinds of irrigators that don't use the Hydro Floss' patented technology. While two studies do not always make a fact, they have certainly provided intellectual food to chew on! We do not make health claims and more studies may be needed. You do receive a 30 day money back guarantee with your Hydro Floss. I find that most of my customers already have owned a hydrofloss. Some tell me they have used the hydrofloss oral irrigator for 15+ years. What this translates to is that you can rest assured that you are getting the best when you choose the Hydro Floss. The HydroFloss oral irrigator's magnetic technology was discovered by an 'average guy' who was told that he was going to lose his teeth. He was told to go home and when they fell out, the periodontist would install new teeth for him. Most likely this meant implants or dentures. He did not like the sound of that so he went home and an idea struck him. He worked in an industry where they were using magnets to keep pipes clean. He applied the same concept to another brand of irrigator that he had at home. The results were astounding. He found that his dental health improved. He went back to the same periodontist who confirmed that he had managed to save his teeth. This is the origins of the Hydro Floss oral irrigator. Every human body is different and there is no guarantee that what worked for one person will work for you. However, I have had the experience of seeing my own dental health improve from using the HydroFloss as well. I was told that I did not need an expensive treatment that had previously been recommended to me. Therefore, I am a believer. I have talked to many hydrofloss users now and their does seem to be a large group of people who believe they have had dental health improvement from using the HydroFloss. Many dentists and hygienists are now recommending it to their patients. The Hydro Floss oral irrigator is not 'new' - it has a track record of over 20 years now. As stated previously, results may vary, because human bodies are all different and do not have the same chemical makeup or environment circumstances. Therefore, it is impossible to say the experience will be universal. Yet it does seem that many people have benefited from their use of the Hydrofloss. Phone us with your questions. 888-586-6849.